Mat foundation is also known as the raft foundation. It is a continuous thick concrete slab on the soil that extends the entire footprint of the building and increases the soil bearing capacity power. This foundation supports the entire building loads and safely transfer it to the ground. Raft/Mat foundation is used in those places where we have less bearing capacity of the soil. At those places, we use mat foundations to distributes the whole loads of the structure to the soil (When the area of the footing was increase than the soil load-bearing capacity will also increase) because this foundation reduces the stress on the soil at the same place. Stress = Weight / Area = 130 / 70 = 1.85 tons weight per m2. This foundation is very useful for basement structures. A waterproof membrane sheet is placed over the ground surface and then 4″ PCC is poured to create a level base for the Mat/raft foundation. After the PCC, reinforcement steel bars is tied (cage) in place and then the desired thickness of concrete(According to the design) is poured. Bearing capacity of the soil is weak and not capable to transfer the load of building to the ground. A column is placed near to the property line and walls are so close that individual footing would overlap. If the cost of a deep foundation (Pile foundation) is higher than the raft foundation we use to make the structure economical. When a spread footing columns can cover up to 50% of the foundation area. 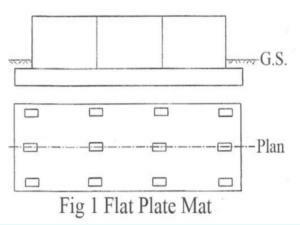 Flat plate raft is used in the small and lightweight load structure. This type of foundation is suitable when the soil is not compressible. The reinforcement bars are provided in both direction top and bottom in the form of a mesh (cage). Minimum 6 inches of thick RCC slab is used in this foundation. The Slab thickness should be increased when the upcoming column loads are very heavy. The flat plate foundation is not suitable in those structures where the column loads are very high then the thickened flat plate is used. The heavy loads create the diagonal shear in the slab and also create a negative bending moment on columns, so the thickness of RCC slab under the column should be thickened. 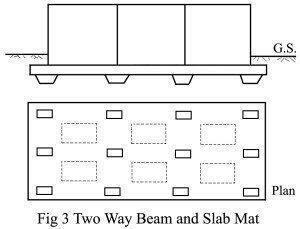 In this type of mat foundation, beams are placed in perpendicular directions and all the beams are connected by RCC slab. The columns are placed on the intersection of beams. Two-way slab and beam raft foundation is suitable when the columns are carrying unequal loads and the spacing is large between them. This foundation is supported by piles in the soil. Piled raft foundation is suitable for the soil of high compressibility and where the water table is high. Piled raft foundation is mostly used for the high rise buildings. The piles were used to reduce the amount of soil settlement(With the passage of time) and increase the soil load-bearing capacity. Rigid frame mat is used, when the columns have a very high load on them. In rigid frame mat design, the basement RCC wall acts as a deep beam or ribs. 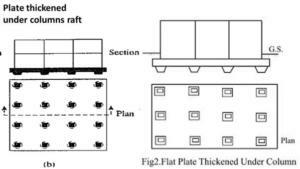 If the foundation depth is greater than 90 cm then the rigid frame raft is used. It is also termed as box mat foundation. In cellular mat foundation, the structures of boxes are formed and walls of every box act as beams. The walls are connected by slabs at top and bottom. This type of foundation is suitable for loose soil. The foundation and ground floor slab is poured at the same time so which reduces our construction time and material. It is provided where the shallow foundation is possible but the condition of the soil is poor. Reduces the cost of constructing a floor slab (But not fully economical). Helps in the transferring of loads over a wide area. It shows good resistance and cannot slide during the flood. We can handle more heavy loads as compared to other types of foundations. Raft foundation requires a large quantity of steel and concrete. This foundation is costly (Volume of footing were increasing). It is not suitable and used for domestic home construction. Special measurement is needed in case of concentrated loads. In the mat foundation, skilled labours are required.